Purchase and trade from our huge selection of Skaven Models and accessories. Build a powerful Skaven Army and dominate in your next Warhammer Fantasy Battle. Skaven Figures are human sized rat like creatures. They live underground and are despised by humanoids. They are smart and coniving but because of their selfish and backstabbing ways they can never seem to hold together long enought to triumph over the top side world. Skaven Armies hold the number thirteen in highest esteem and worship it. 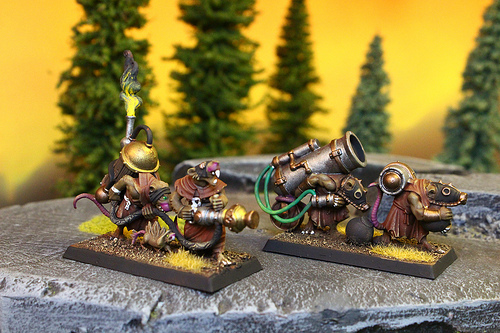 Their are lots of different options when it comes to building your Skaven Army. You can choose your pick of core units like Clanrats, Skavenslaves and Nightrunners. Add some special units for fire power like Gut Runners and Plague Monks. Then finish by selecting your heros such as Throt the Unclean or Ikit Claw. Blue Table Painting can help you paint your armies up just how you want them. Take your gaming experience to the next level on the Blue Table Painting Website.